If you had to argue for the merits of one Australian book, one piece of writing, what would it be? 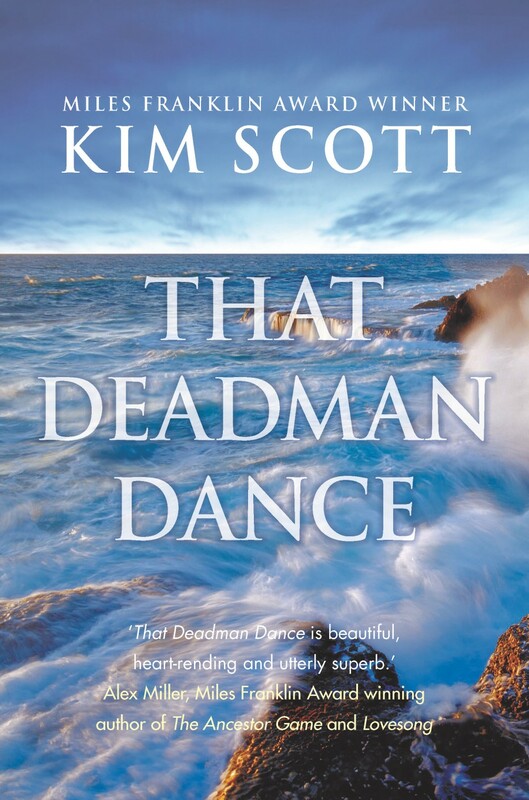 Kim Scott’s That deadman dance, chosen by Tony Hughes-D’Aeth, Associate Professor, English and Cultural Studies, University of Western Australia. (See my review). It is not controversial, though some readers found it a little hard to read, and it won a swag of awards, as Hughes-D’Aeth tells us at the start of his case. However, he makes a case on the basis of its importance and relevance to the ongoing discussion in Australia about the facts and implications of first contact. And his case has to do with what he calls Scott’s “bold wager” that “he wanted to write a novel from the point of view of Aboriginal confidence” and that he was “inspired [to do so] by history”. Hughes-D’Aeth discusses his surprise at this idea of “confidence”, given that the history is one of “decimation” and “cultural annihilation”. You can read his “case” if you’d like. I should clarify, before I continue, that The Conversation also says that the work can be “fiction or non-fiction, contemporary or historical”. Peter Temple’s The broken shore: this one does meet my “controversial” expectation. What, many asked, was a crime novel doing being longlisted for the Miles Franklin Award (which Peter Temple went on to win with his next crime novel, Truth)? Mark Willacy’s Fukushima: I do remember some articles on the disaster by Willacy, who was based in Japan at the time, but was not aware of this book. Of the eighteen cases listed on the site, the one that stands out as a bit odd to me is Johnny Warren’s book, published in 2002. Warren was a legendary Australian footballer. Casemaker Lee McGowan (Senior Lecturer, Postgraduate Coursework Studies, Queensland University of Technology) admits that the book has its weaknesses, but argues that it’s important nonetheless. He says that “the book’s title refers to what Warren described as a ‘mentality’ that exists around football in its early days in Australia, a mentality he implied was borne of fear.” McGowan suggests this seems outdated now – though I’m not sure exactly what he’s saying is outdated. The words in the title? The mentality? The fear? He doesn’t explore this further, but moves on to say that the book’s main value is that it “remains the best, most insightful account of the Australian game’s contemporary development”. I guess I wouldn’t see the development of football as a critical issue warranting my attention, but to each their own I suppose. contemporary readers are confronted with the fruits of Australia’s racist policies concerning Aboriginal peoples. which tends to function in ignorance of the ongoing cultural disenfranchisement of Australia’s first peoples. Literature, as we all know, comes in and out of fashion, sometimes for reasons that aren’t immediately obvious. I love this initiative by The Conversation – and hope further academics and researchers take up their offer to present cases. Anyhow, I’m sharing this series for a couple of reasons. One is that it provides yet another list to look at when considering what to read next. And the other is, as you’ve probably guessed, to ask, What book* would you make a case for – and why? I will make a case for a book in a future Monday musings! * Preferably from your own national literature. Yes, hard to choose one … but thanks so much for playing along, John. I do hope others will too. It will be interesting to see. Thanks Arti. No, I’ve read a LOT about The light between oceans. It’s been very popular here and did spear on a couple of prize shortlists. I know nothing about the author at all though. I don’t feel the need to read a book before I see the movie but IF I do want to read a book, I much prefer to read it first. I think I should try to read this before the movie appears. What makes you decide whether to write a review or not? Re Whiplash, I think it’s too long since I’ve seen the film now for me to say anything meaningful, but will try! You can say it’s incubating period. 😉 I usually leave a film aside and wait if I’ve anything worthwhile to say before I decide to write about it. I changed my mind about Whiplash is because of the issue it raises regarding, as you’ve so eloquently said in your comment on my post, the process of art making, and actually in anything worthwhile and of value. But the film too deserves recognition in its cinematic elements. So there, my review, after much mulling I must say. I like that, Arti … Trouble is if I incubate for long I lose it! My preference is to draft my review and then sit on it a few hours or a day or so but sometimes I feel that more incubating would produce a better result, if I really did incubate. But I’m usually off on the next book by then and starting to incubate it! With film I guess it’s different. You don’t always have a film on the go ie you don’t finish one and immediately start another … Unless you’re at a festival! Go for it, ST: a wonderful idea ! And do you have a book you’d argue a case for MR … besides your own that is! Important: did you receive an email from me about an hour or so ago ? Oh, will check MR … I don’t sync all my emails to my iPad which is what I’m using now. I have too many email addresses it would overwhelm me to have them all here! What a great series! Prompts you to think about books and why they might be important which is always a good thing! Yes, that’s it Stefanie … The thinking about “why” they are worth keeping in people’s minds. I too love the ‘the case for’ series, and tried to nag The Conversation to give a package of all the books away to someone who donated during their subscriberthon. I reckon I’d argue for ‘The Women in Black’ by Madeleine St John. Oh yes Jane, that would be a good one … Simple on the surface but a lovely snapshot of Australian society at a really transitional stage isn’t it! And such a good insight into the mind of a young woman. I like how seriously it takes the little agonies and joys of it all. Yes, you are right. Lisa finished school a couple of decades or so before I did, I could so relate to her uncertainty, and naiveté. But I suppose most young women could, if they are prepared to see the work in context. MR, No sight of your email … can you please send it again, either to wg1775@gmail.com or to another address of mine if you have it. I don’t make my personal email addresses public. Thanks for the link to the Conversation. I’m still struggling to think of a book I would advocate for from Wales that isn’t already widely known. Thanks Karen — I’m glad you liked the link and that it’s got you thinking! It is a really good idea and so many Australian writers I have not read but sound really good! I have read The Fortunes Of Richard Mahoney which is an amazing novel and Have read Malouf who is very good.Scotland is probably rather similar to Australia in having an awful lot of good books/writers that are much less known in other parts of the Anglosphere. I suspect you are right Ian … if you could present an under appreciated Kate’s Scottish novel to the world, what would you choose? BTW what Maloufs have you read and liked? I liked Remembering Babylon very much though it is one of those books read a few years ago and need to read again. An Imaginary Life is the Ovid novel, right? That is defiinately on thr TBR list. Randolph Stowe is also a name I remember and sure I read one novel of his which I liked a lot but have probably lost. The Scottish novel is probably James Hogg’s Memoirs And Confessions Of A Justified Sinner. It is not an unknown novel but should be better known – critic and novelist Walter Allen wrote that Jekyll And Hyde was, compared to Hogg’s classic, a crude melodrama. Yes, that is the Ovid book and is probably the one of his I like least but I think I read it at a bad time so it’ds one I want to revisit. I like Remembering Babylon and The conversations at Curlow Creek. Ransom is a very good read too. Malouf is such a dignified, gracious man … A real man of letters for us I think. And thanks for that Scottish title. I don’t know it or the author at all, so will add it to the list. The reference to Jekyll and Hyde has intrigued me. To continue the Indigenous theme, I would make a case for W. E. H. Stanner’s White Man Got No Dreaming. It is a sterling example of humanistic thought as well as a brilliant compendium of insights into Aboriginal culture and the history of relations between Indigenous and settler culture. Thanks a bunch Will for joining in. I’ve heard of Stanner of course, but have not read this. Long ago I read some of his Boyer lectures, but I don’t recollect much detail now. This sounds worth reading.